It has been an eventful time for Frying Nemo – as the Fish and Chippery has been awarded Best Fish and Chips in the Northern Territory for the second consecutive time. Following this local win Frying Nemo went on to represent the Northern Territory at the National Seafood Industry Awards – competing with the winners from all states and territories from around the country for the sought after title of Best Fish and Chips in Australia. This culminated in a National Awards night in Sydney where Frying Nemo was officially announced as the overall winner when it was judged and awarded the BEST FISH and CHIPS in AUSTRALIA by the National Seafood Industry! 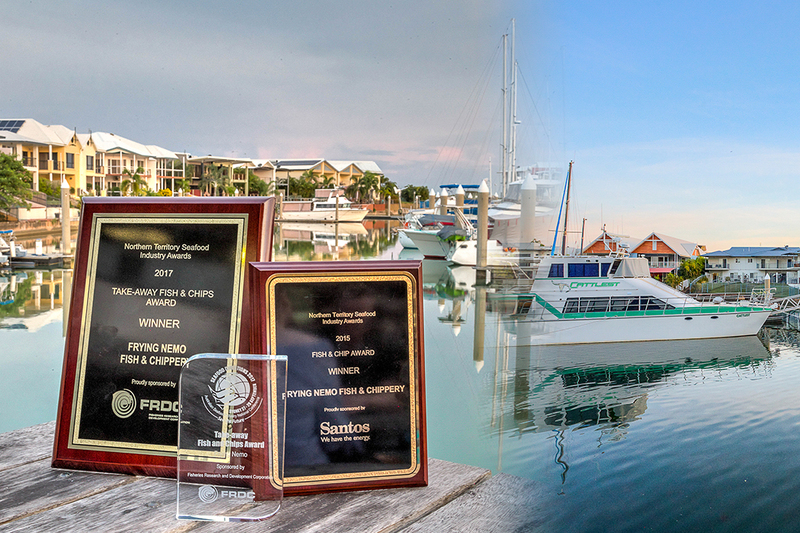 As a Territory business, Frying Nemo is thrilled to be given this recognition on a national level and especially happy to bring this award home to Darwin and the Northern Territory. Idyllically located waterside on the marina at Tipperary Waters – the menu showcases the best of local Northern Territory and Australian seafood. Additional seasonal specials give customers the opportunity to experience up to a dozen different fish varieties at any one time and provides the opportunity for customers to experience the vast array of flavours that are available to us within Australia from such a diverse range of fish. Favorites include King George Whiting, Golden Snapper, Mangrove Jack, Flathead, Jewfish, Barramundi and Spanish Mackerel to name a few and of course, Nemo’s scrumptious coconut crusted NT Banana Prawns with dipping sauce. Menu items are freshly handcrafted on premise at Frying Nemo and prepared to order, with all batters and salads house-made. There is something for everyone with vegetarian alternatives and gluten free options also available – as well as meat lovers being provided for with a range of Territory inspired Australiana Burgers that include crocodile, buffalo, kangaroo, camel and traditional favorites to entice all tastes. As a perfect accompaniment to the delicious food the venue is fully licensed and is definitely – thirst quencher guaranteed! With a choice of Asahi and the popular Mountain Goat craft beer pouring on tap – plus a fantastic selection of craft beers, alcoholic cider and ginger beer. Also, offering standard and premium spirits as well as an extensive list of wines available by the glass and bottle. All are welcome at Frying Nemo – with counter service for eat in or takeaway. The perfect venue for all occasions – such as a drink and catch up with friends and family or a group booking celebration – there is also a fun area for children to play. Frying Nemo’s friendly and relaxed vibe is the ideal place to enjoy!